Until now, the use of fracking for oil and gas extraction has outpaced scientific evidence of negative impacts, causing a lag in more stringent regulations of its use. But science is catching up, helping critics get the support to encourage better oversight and regulation of fracking. The biggest roadblock appears to be the juggernaut of capitalist ideology and power that in the face of escalating ecological catastrophe refuses to give up its short-term profit-driven death grip on the planet. Karen Charmen (2010), Trashing the Planet for Natural Gas. There was an article in the Guardian recently about polar bears, but rather than trying to win our sympathy for the plight of the polar bears versus climate change, the article discussed how the intangible nature of climate change has caused a phenomenon perhaps best referred to as climate change and environmental complacency. But what precisely would it take to shake us loose from this complacency? Many people who live near hydraulic fracturing (fracking) sites have been moved to a state of perpetual unease when mysterious illnesses strike, water becomes flammable or seismic activity rattles homes in new and unusual locations. Yet, despite anti-fracking protests and an increasingly large number of people claiming fracking is the cause of their ailments, efforts to halt it appear to be in vain. The fracking trend is gaining ground by making its way out of the American cradle, into oil and gas bearing lands abroad. Up until now development and use of fracking technology, at least in the US, has gone full speed ahead while science and regulations seemingly lag behind. Finally, science is beginning to support claims in favour of those who oppose the use of hydraulic fracturing in their communities. 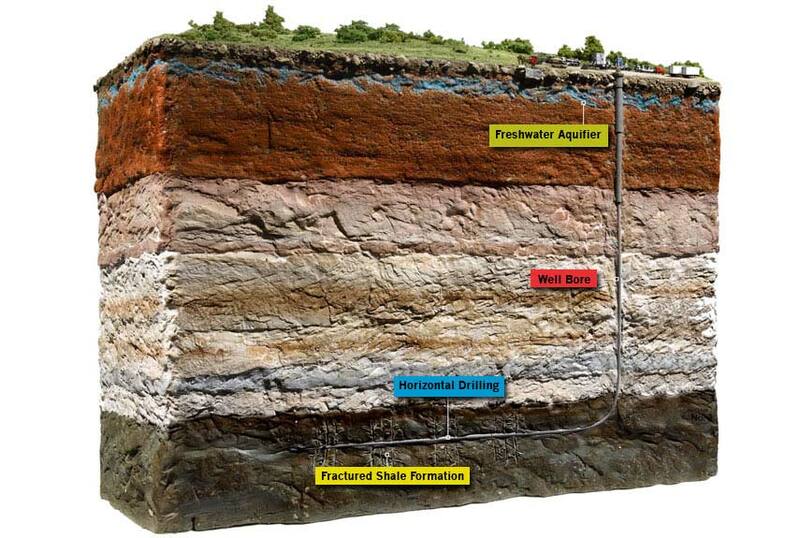 The anatomy of a fracking well. Source: naturalgasnow.org. The science around the impacts of fracking has finally started to catch up with the industry. The last 18 months have witnessed a four-fold increase in the scientific evidence supporting those who have denouncing it for years, illustrating how the technology is disruptive, toxic and under-regulated, causing serious impacts on health and social well-being. In terms of human health, illnesses linked with fracking can be mysterious and often hard to link to actual fracking activities, which is exactly where the importance of science comes into play. 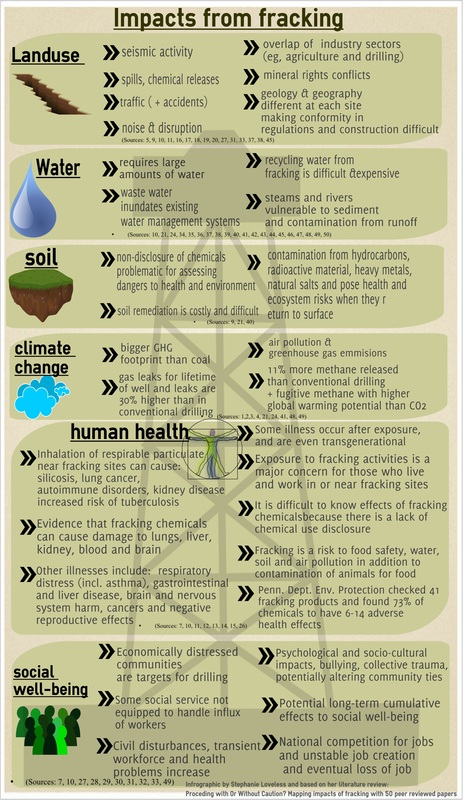 Fracking has been found to be a risk to food safety, water, soil and air pollution, in addition to contamination of animals as a food source. The Pennsylvania Department of Environmental Protection checked 41 fracking products and found 73% of chemicals to have 6-14 adverse health effects. Illnesses linked with fracking include a range of cancers, organ malfunction and failure, fertility issues and harm to the brain and nervous system. Even now, it is difficult to get the full list of chemicals used in fracking because companies consider this to be proprietary information. Thus, the risks of chemicals used are difficult to determine when scientists are not sure precisely what to test. Aside from physical health, the well-being of communities is also impacted by fracking in terms of strained social services, disruption from fracking sites and increased traffic—including a higher number of accidents—and competition for jobs. It is also thought that fracking can cause collective trauma when mass illness or disruptions take place and could potentially alter communities forever. Fracked communities are further distressed when ecosystems, especially water and soil, become waste bins for toxic chemical run-off with exorbitant remediation costs, many of which are externalised to the local community. Since oil and gas companies have seemingly bottom-less budgets, they are able to woo communities into prioritising water use for fracking, as the process requires huge amounts of water. Finally, other environmental impacts of fracking are related to climate change with increased ground ozone, particulate and methane emissions—methane has a higher warming potential than CO2. The greenhouse gas footprint of fracking is said to exceed that of coal and have 11% higher methane emissions and a 30% higher rate of gas leaks over the lifetime of wells for fracking. Science also confirms impacts from land use change such as seismic activity, mineral rights conflicts and the overlap of non-compatible sectors (eg. fracking and agriculture). The potential benefits of fracking—including lower fuel costs, reduced air pollution, industry jobs and secondary service sector jobs—are questionable when compared to the high costs of health, environmental and societal impacts of fracking. In addition to health, environment and societal impacts, there are also a wealth of political and economic impacts felt from fracking. To name a few, governments justify the use of fracking in the name of energy and national security, but, as in the case of the United States, have not followed through with stringent enough regulations to keep people on the home front safe when using fracking. Lack of regulation has created tension between governments and the increasing number of people opposing the use of the technology in addition to influencing global markets (ie. evidence both in favor and against shale gas affecting oil prices) and geopolitical relations between governments. 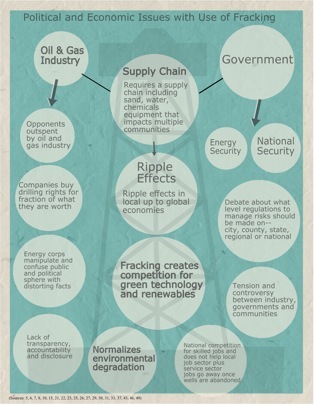 The oil and gas industry is also an extremely influential and powerful player, which buys them an entire supply chain needed to support fracking activities, and again, having ripple effects from local up to global communities, markets and government relations. Unfortunately many of effects of the industry’s actions are veiled behind the industry’s opaque modus operandi and this is part of what perpetuates their actions. Getting sound support behind those who oppose fracking is particularly important as European countries are increasingly attracted to the technology, although at least for the foreseeable future several countries including Bulgaria, France, and Germany tend to take a more conservative approach to shale gas exploitation. Yet, others such as Denmark, Ireland, Netherlands, Poland and the UK are interested in rolling out the red carpet for fracking even as the momentum seems to be losing steam in Europe. Suffice to say, the oil and gas industry has not yet been held fully accountable for implementing stringent environmental and health standards. In part, this is due to the lag in science being able to inform regulations, but now things are beginning to change as more research is being done on health, environmental and social impacts of fracking. However, even as science catches up, the full health, environmental and social impacts will not be felt for years—perhaps even after fracking wells have long dried up and industries have moved out of the area, making accountability difficult. Hopefully once science can provide sound evidence for the impacts discussed here, governments will be encouraged to implement tight regulations now, better ensuring public and environmental health and minimising impacts in the future. Timeline depicting how the fracking industry (technology, development and implementation) moves at a much quicker pace than science (impact research) and regulations. *Stephanie Loveless has received a double master degree in Environmental Science and Agriculture from the German University of Hohenheim and the Danish University of Copenhagen with specializations in Climate Change and Environmental Management. She has experience in researching community participation in making conservation areas in Northern Tanzania in addition to working with conservation easements and a land trust organization in Southern Colorado. This article was originally published by World Watch Institute Europe, under the title of “What you need to know about health and environmental impacts of fracking”. For a full list of references, click here.